Truly Polished: Nail Mail and haul! I've had such a busy day... That's all I ever seem to say these days! My Mum rang me at 9.30 to ask if I wanted to go to the gym so I did that, did a bit of shopping, came home and did some washing, then went for a walk with my Mum and her dogs, then finally at 7pm I had my first meal of the day! Then I planned a guest post for another blog and took half the photos I need... The life of a single (while the bf is away) mother and nail blogger is a very busy one! Now I'm going to sit and watch some TV and eat chocolate brownies, only a couple I promise! The polishes I bought today evened out at about £1 each which is amazing in my opinion!!! I'm sure my boyfriend will agree too if he's reading this! Most of these are for my upcoming guest posts over at Island Girl Insights but a couple are because I NEEDED them! Revlon, MUA, 2true and NYC Colors goodies! The MUA polishes are always £1, which I think is really good, they're small bottles but it means that you can get lots and mix and match. I got the 2true polishes in a 2 for one, and I saved money on the NYC ones because I bought two (one was to add to my giveaway). On my way out of town I thought I'd stop in Poundland. I'm always checking in there for nail polish, mostly because I always hear Americans saying they find great old discontinued shades in dollar stores. Anyway, I found these Revlon polishes in there! The green on the left is a matte finish, and I'm sure it's an old bottle because it had leaked all over the place and was sooo gloopy!!! The other four are amazing though, great formula and great shimmery glass fleck appearance. When I was feeling stressed this afternoon trying to tidy up, the post lady arrived at my door with some nail mail! 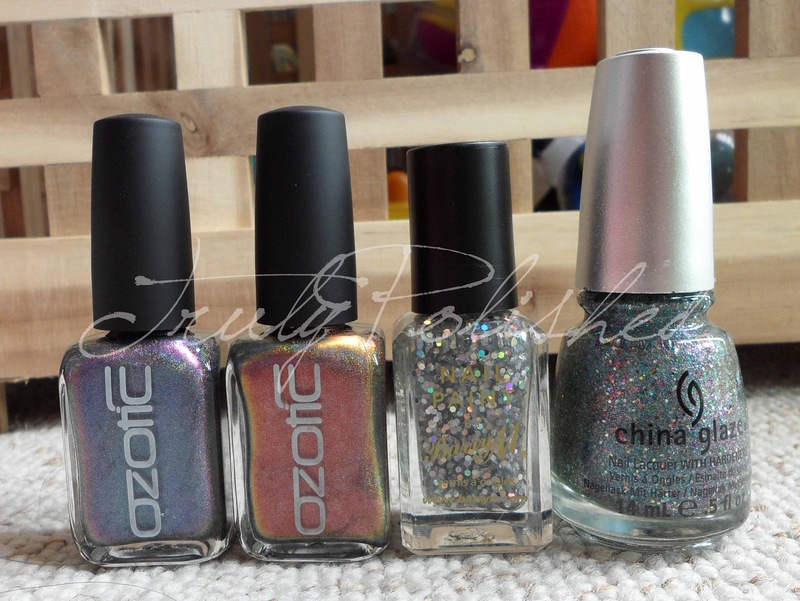 I got my two Ozotic polishes from the Llarowe birthday sale and my first order from Nail Polish Direct. They sell China Glaze, OPI etc for more reasonable prices than other sites. 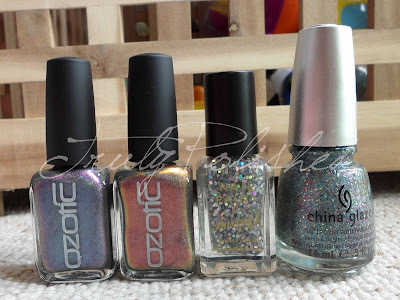 I bought one of the China Glaze Prismatic colours as well as Barry M Hologram Hexograms, it was cheaper there than on the Barry M site with free delivery, and I've wanted it for ages so I thought I might as well buy it! I haven't done a haul post like this in ages so I thought today was the right time! See you back here tomorrow for a normal post! I'm writing my post for her as we speak, I'm quite pleased with how it turned out! Can't wait to see yours!